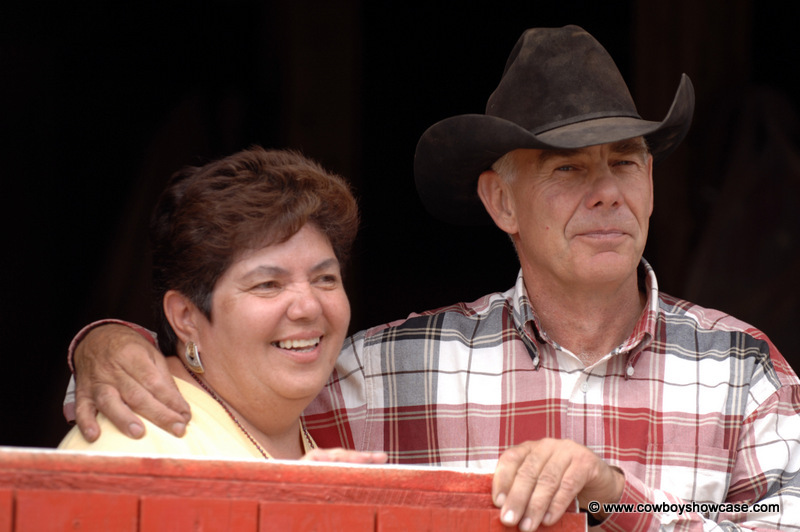 In the summer of 2005, Lee and I were invited by Ray and Carolyn Hunt to attend a Colt Starting and Horsemanship Clinic conducted by Ray at the Gang Ranch in British Columbia, Canada. We flew from Elko, Nevada to Vancouver, B.C. 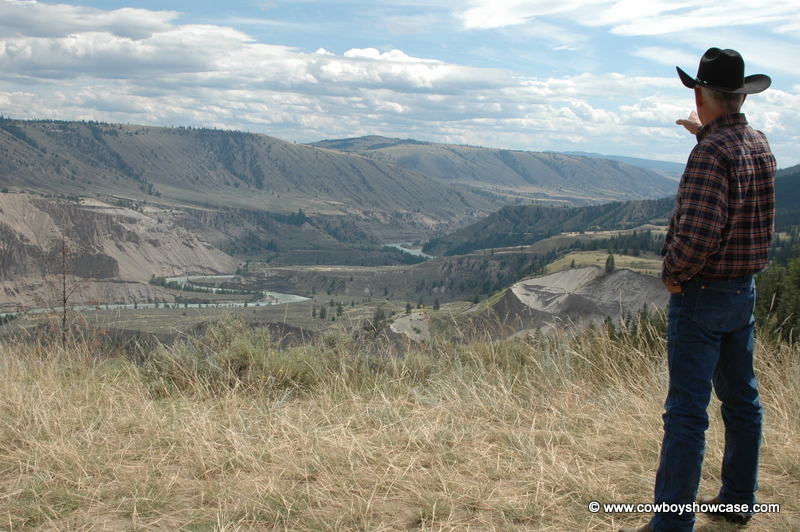 and rented a vehicle and drove 300 miles north into the “bush” along the Fraser River to the town of Clinton, BC. From there, we went west 70 miles on a gravel road, crossed the Fraser River on a high suspension bridge, and arrived at the Gang Ranch Headquarters. The managers of the Gang Ranch, Larry and Bev Ramstad, and Ray and Carolyn Hunt greeted us. We had met Larry and Bev earlier at the Ray Hunt Western Horseman of Year Event in Fort Worth, Texas. They put us up in the guest quarters at the ranch. Over dinner that evening, Larry and Bev gave us some history of the Gang, and talked about the cowboys, horses, and cattle. 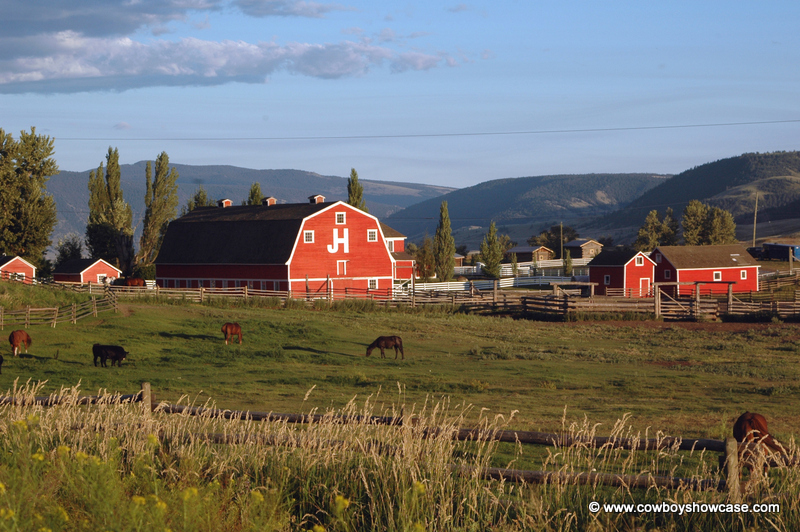 The Gang Ranch in British Columbia, Canada is one of the most spectacular working ranches operating in North America today. It is located in the Cariboo Region, bordering the Fraser River in the heart of British Columbia’s cattle country. This region contains majestic mountain ranges, timber stands, alpine meadows, miles of bunch-grass hillsides and untamed, unforgiving rivers. There is a real last-frontier feeling about this remote ranch. Larry told us that in the mid 1800s, the Colonial Government was starting to form the province of British Columbia. Cattlemen, south of the border in the United States, were encouraged to trail their cowherds to British Columbia into an area where gold had been discovered and miners were hungry for beef. At this time, there were very few cattle in British Columbia. Cattle drives from as far south as French Glen and other ranching communities such as Baker, Burns and Bend in Eastern Oregon’s High Desert Country headed north. Once across the border, there was little pressure put on these American cattlemen by the local Canadian officials along the trail. The Canadian government offered generous leases to them to establish cattle ranches with little or no interference in running their affairs. Around 1860, Jerome and Thaddeus Harper, brothers who had been born in Tucker County, West Virginia, caught the “gold fever” and rode into British Columbia from California and up the Cariboo Trail to the gold fields. They saw immediately that there was a great demand for beef. Cattle could be worth much more than looking for gold. Cattle that were purchased for ten dollars a head in the United States could be sold for over one hundred dollars a head in the gold fields of British Columbia. Timing means everything in the cattle business and the time was right to start bringing cattle into British Columbia. The Harper brothers went back to Oregon and put together a herd of cattle to bring back to the hungry gold miners. The Harper Brothers were very successful in providing cattle, and saddle and packhorses from the United States for the British Columbian gold miners and they began to look around for land to establish a ranch. When they crossed the Fraser River near the present day Gang Ranch headquarters, west of the town of Clinton, they came upon a country that was a cattleman’s dream with the finest bunch grass hillsides they had ever seen. This grass stretched for miles in every direction. They settled and developed land forming the Gang Ranch, a ranch that, at one time, was considered one of the largest and most famous ranches in the world, controlling over four million acres of land and thousands of cattle and horses. The Harper Brothers played a pivotal role in the start of the cattle business, as we know it today, in British Columbia. 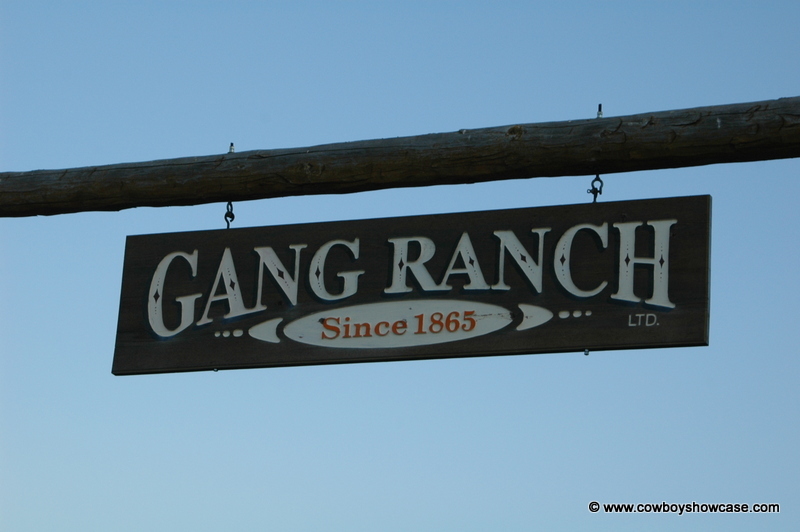 No one still alive today is positive where the name “Gang Ranch” came from. Some say the ranch was named for the large double-furrow plow called a “Gang Plow” that was pulled by several teams of workhorses and others say perhaps it was named for the number of workers it took to run a place of this size. 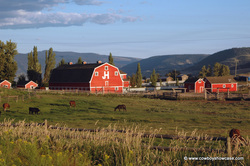 The ranch brand, JH connected, was formed from Jerome Harper’s initials, registered with the Provincial government around 1869, and is still in use on the ranch today. After the Harper Brothers passed away, their ranch holdings began to dissolve. Some of the land was traded off and some sold, and then resold several times. The ranch went into receivership and was eventually taken over by the present owner Sheik Ibrahim Afandi of Saudi Arabia. The Gang Ranch at one time rivaled Douglas Lake as the largest working cow ranch in British Columbia, but now is second in private land size and cattle numbers, although it controls more total land through Crown Land grazing permits, covering an area 87 miles long and 40 miles wide. Larry made managing a ranch and cattle numbers of this size sound easy, but there is much more to it than that. Some of the land is privately owned and some land that the ranch leases to run cattle on is Crown Land, owned by the Provincial Government. (Much like U, S Forest Service Lands in the U.S.) Larry follows a grazing plan approved by the Crown Land officials. A flow chart is developed showing how Gang ranch cattle are to be managed on Crown lands and their seasons of use. It is very similar to an allotment-management grazing plan used by The U S Forest Service in the United States. Running a large ranch of this size, takes special people who are used to living in a very remote area. Williams Lake is approximately 80 miles away on a gravel road. The ranch has its own post office and small general store where the hired hands can get a few necessary staples. Bev Ramstad makes the trip once a week to Williams Lake to get groceries and supplies. The mail comes in on Wednesdays and Bev is the postmistress for a day. The ranch employees try to get together once a month to celebrate birthdays, anniversaries, etc. At one time, there was a schoolhouse and a teacher on the ranch, but this school was closed several years ago. During the summer months, when haying is in full swing, there will be 28-30 employees working around the ranch, including the managers, cowboss, a ranch boss, a mechanic, two cooks and the farm crew. The cowboys will be gone to mountains for the summer with the cattle. The farm crew puts up around 6,000 tons of irrigated meadow hay. Barley and alfalfa are also grown on about 1,200 irrigated acres. A large water-storage lake has been built to irrigate crops. The hay crop is put up with modern tractors and haying equipment. The Gang quit haying and feeding with teams of workhorses in the early 1960,s. Large round bales, each weighing about 1,800 pounds, are fed to the cattle using tractors and special feeding equipment. No off-ranch hay is bought to feed the cattle in the winter months. Manager Ramstad said,” It takes about a ton and a half of hay to feed one cow through the winter here on the ranch.” The amount of hay that is put up on the ranch dictates how many cattle the ranch can run. The ranch today still covers over a million acres. This remote and unforgiving piece of real estate is not suited for people who do not want to be challenged. The winter weather, at times, can be brutal. 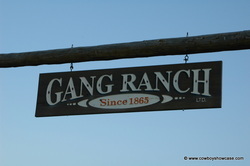 The Gang ranch is a cowboy place where you and your horse are tested each day. 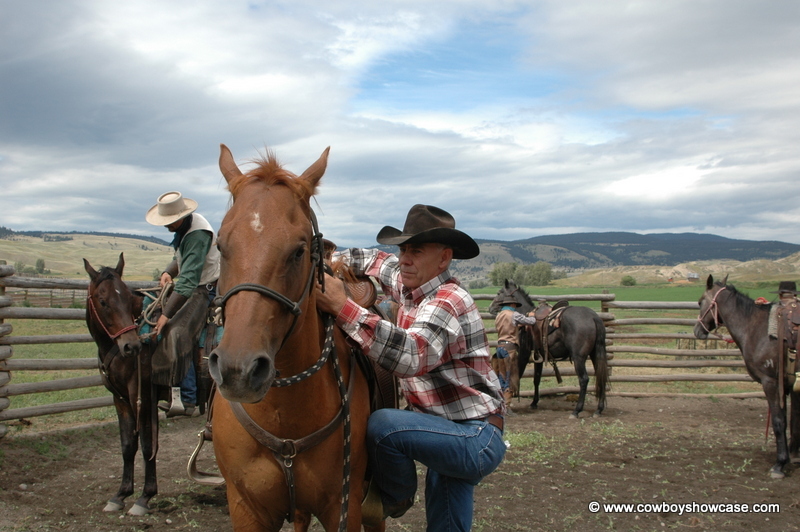 Larry started cowboying in Nicola Valley, British Columbia then headed for New Zealand and Australia to work on remote ranches in those countries for a couple of years. He then came back to British Columbia and cowboyed on and managed a number of different ranches before taking over as manager of the Gang. His wife, Bev, grew up on a remote British Columbia ranch and is from a third generation ranch family and has been around horses, cattle and cowboys her whole life. When Larry and Bev took over the reins, they knew the reputation of the ranch. The Gang ranch was a very difficult place to run. Larry said, “When we took over as managers of this ranch in 1989, the place was falling down around us. Corrals had to be reworked; buildings needed to be repaired; irrigation systems and hay grounds needed attention. A cowboy and ranch crew needed to be hired. The cowherd was in bad shape and we needed to upgrade our horse herd. We had to take care of the cattle’s welfare first and then plug away at the ranch improvement as we found time.” It has been said that it takes three crews to run this huge ranch, one coming, one leaving, and one working. Through all of this the Ramstad,s have toughed it out and carved themselves a place in Gang Ranch history. This ranch today is a showplace with green well-cared-for lawns, a cookhouse with waxed floors where the crew is fed by the ranch cook (you take your boots off outside the cook house door before you enter) and freshly painted headquarters buildings and horse barn. A major figure on a ranch this size is the cowboss. The cowboss’s job is to take care of the cattle, and supervise a crew of cowboys. He also assigns the cowboys a string of horses from the ranch cavvy for their daily use. The cowboss must be a strong leader, a good teacher, and have lots of patience. He must be handy with horses and a rope and be able to find his way through the country. He also must know the ways of cattle and horses. The cowboss takes his orders from the General Manager. Many highly qualified cowbosses have come and gone on this historic ranch since it’s beginning in the 1860’s. Ed Russell was the cowboss while we were there and had been at the job for several years. Ed and his wife Racquel and infant son Dally lived in the cowboss’s quarters near headquarters. There are usually from 8-10 full-time cowboys employed on the Gang. Most of the cowboys the ranch hires are single. The ranch quarters are not set up for married cowboys with families. The men are hired to ride and tend cattle 12 months a year. They do not hay or fix fence. They ride on cattle. 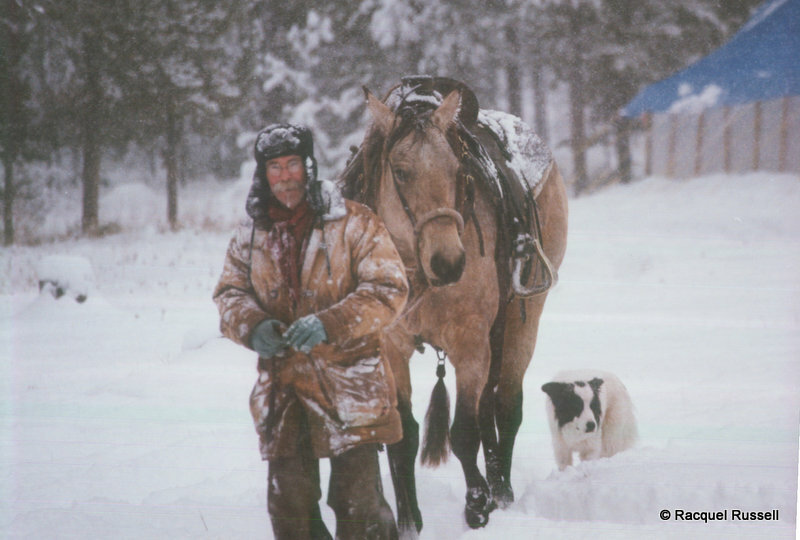 There are very few days when cowboys on the Gang do not saddle their horses, regardless of the weather conditions. Each man is responsible for shoeing his string of 8-10 horses issued to him by the cowboss. These horses are his to ride and take care of until he leaves the ranch and no other cowboy, including the cowboss, may ride them unless they ask. In the horse barn at headquarters, each man is assigned a stall to grain and saddle his horse and to keep his personal gear. He is responsible for keeping his area swept and clean. No other cowboy can take over his stall until he leaves the ranch. The Gang Ranch buckaroo protocol is very similar to the Great Basin “straight up buckaroo“ outfits I have been around through the years. In the summer months when the cattle have ”gone to the mountain” as they say on the Gang, cowboys stay miles from headquarters in isolated log cabin cow camps in five different locations in the mountains with their cattle and horses. A two-way radio system is used between the camps and headquarters. There are two men to a camp and supplies and food are packed in with packhorses, because there are no roads in many of the cattle’s summer-range areas. These cowboys will stay in the mountains holding the cows on mountain meadow feed after the calves have been weaned and shipped until after Christmas. There will be years when the temperature can drop below zero with deep snow before they get to the main ranch with the cows. Occasionally remnant cattle and bulls are still out after the cows come home in the winter. The lost cattle will be found from the air using a fixed wing aircraft or a helicopter flying just after a fresh snowfall when you can see the tracks. When these cattle are found, a note is dropped from the aircraft to cowboys on the ground with a map and directions to the cattle. The cowboys, followed by their dogs, will ride in horseback busting a trail in the deep snow and bring the remnant cattle out, sometimes on the end of a rope! Through the years, many Indian cowboys from their near-by settlements at Dog Creek, Alkali Lake, and Canoe Creek have worked for the Gang. Several years ago, before immigration laws became so strict, cowboys from the United States would drift onto the Gang and hire on for a riding job. 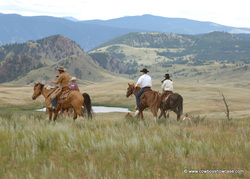 Nowadays, it is very difficult to work on this ranch if you are not a legal Canadian citizen. Cowboys come and go today on this ranch much like they have done for over 100 years. 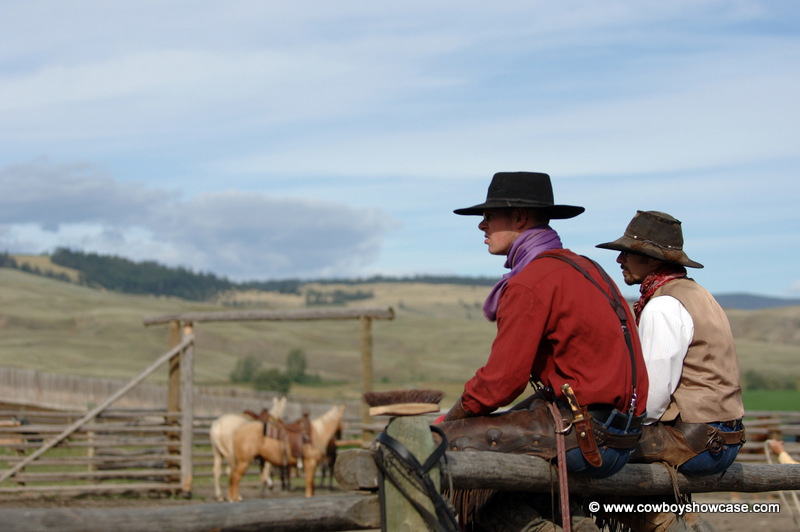 There is very little social life in this remote place so if these young single cowboys need a taste of seeing the girls and the bright lights, chances are they will “roll their beds” and head for town or the next best ranch. One of the cowboys said, “Ranches in British Columbia have tried everything from tractors, pickups, 4-wheelers, airplanes and helicopters, but cows are still more comfortable with a human on horseback and are easier to work. Chances are cowboys on horseback will still be around as long as there are cattle on Canadian ranges.” The men we met at the Gang were working cowboys and were proud of their occupation, no matter how hard the conditions were. Their world revolves around cattle, horses, and dogs. The cowboy dress worn by these young men looks like they just stepped out of the Old West, 100 years ago. All of the men wore cuffs on their wrists, big colorful wild rags, and chinks. Most rode slick-fork saddles (Wade Tree Preferred); with bell stirrups. A snaffle bit and McCarty set up was used on their younger horses. A spade or half-breed bit with California-style rawhide reins were used on their bridle horses. They were packing 50-60 feet of nylon rope with a rawhide hondo and no rubber on the horn. Cowboss Russell said they do not use metal or aluminum hondos on their ropes as they may break if you have a big cow or bull roped in cold weather. In the winter, some of the cowboys wear “wooly” chaps that are made from angora goat hide. They also may ride “eagle beak “ taps to help keep their feet warm. Dogs are a very important tool in moving and finding livestock in a country with this much timber. It is very easy to miss cattle in a timber patch, if you do not have dogs to send in that bark when they find the cattle. Most of the cowboys have a dog or two that they use daily. They like one dog that will find the cattle, hold them up and bark so the cowboys on horseback can find the cattle and dog in the heavy timber. They also use a silent dog that drives the cattle from behind. Several years ago, a stock handler visiting from New Zealand introduced the New Zealand Heading Dog and the Huntaway and they have become popular breeds used on the Gang by the cowboys. Larry said. “If you send out your cowboys and dogs to bring back four stray cows that were spotted along a logging road earlier that day and they come back empty handed because they never found the cows, you can’t let it upset you because it can happen to anyone in this timber country, including me. The trick is to not let cows get away if you do spot them on horseback. If they get away from you once in this thick timber, chances are they will try to beat you again.” This was spoken like a guy who been there and done that! Due to financial problems on the ranch and several changes in ranch ownership, the Gang ranch horses with bloodlines going back in the late 1800s had been dispersed by the mid 1980s. After he became manager in 1989, Ramstad started a new horse-breeding program using a small band of broodmares bred to a leased stud named “Tri Freddy,” an own son of Fred B. Clymer. In 1993, the ranch purchased a Peppy San, Blondies Dude stud named “Winter Dude.” A “Boston Mack” stud replaced him in 1997, but died in 1998. After that for a few years, colts were purchased for saddle stock from two P.M.U. 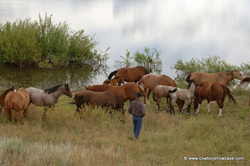 ranches in Alberta that had good breeding programs standing stallions with size and good feet. When the P.M.U business ended, this type of colt was no longer available so the ranch again started raising its own horses. In 2003, the ranch purchased two stallions of Hancock, Blondie’s Dude breeding, “Bear Storm Dude” and “Hancock’s Top Dude,” and placed them each with 10 proven ranch-bred mares. They were still running these two stallions outside with the mare bands in 2005. The ranch halter breaks their colts as weanlings then turns them out until they are started as three-year olds. Talking about the horses and country, Larry said, “We like bigger horses here on the Gang, at least 15.2 hands, with some horses going better than16 hands, weighing around 1,100 pounds, with good feet and the horses wearing a #1 or #2 shoe. We also like some mixed-thoroughbred blood and horses with good withers that travel free and smooth. This country is so big and rough that a horse with a lot of bone in its legs is needed and you need lots of them. The miles are long, the country is steep, and sometimes the snow can be deep. You need to have tough horses to make it on the Gang. Horses here need to be handy with their feet because we work a lot of cows in and out of timber patches where logs are down and it is tough going. If a horse is too big, it does not get around well in heavy, downed timber. Ranch horses are shod during the spring and fall months with borium welded on the underside of the horseshoes and tungsten during the winter to help the horses maintain their footing on the frozen slick ground.” The breeding program Larry began in 1989 has produced horses with the size and stamina to fit the Gang ranch needs. When Larry and Bev took over the ranch as managers, there were eight or nine different breeds of cows and bulls on the ranch. Larry has slowly changed the breeding to more of a straight Black Angus cow outfit. This ranch is a cow/calf operation. The ranch exposes about 3,000 cows to bulls with a calf crop of around 90 percent. Calving of the two-year-old heifers begins around March 1. 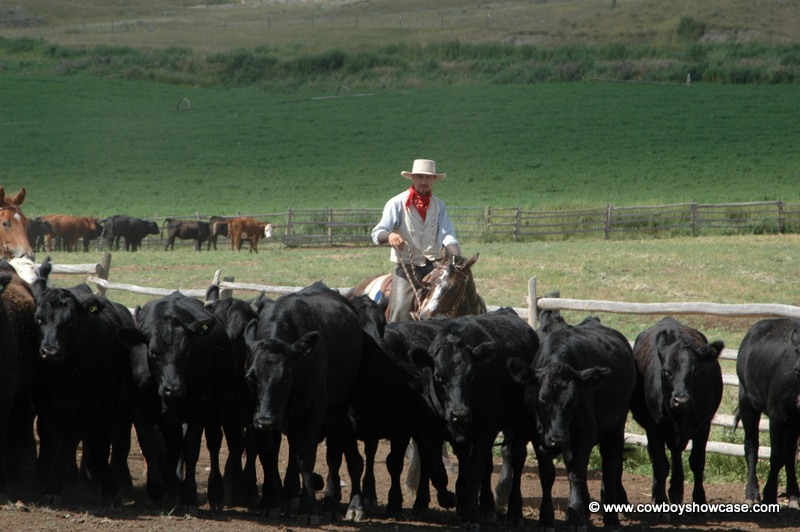 The cowboys ride on cattle daily and the “heavies” (cattle that are soon to calve) are brought to the calving sheds. Crews take care of the calving heifers around the clock. The older cows calve outside on the feed grounds beginning middle of March. After calving is over, branding begins and pairs are kicked outside. Branding crews will brand 150 to 200 calves in a day. These calves are “drug to the fire” with a horse and rope, branded, bulls calves castrated and calf medicine shots given. Once branded up, the cows and calves are started for the summer range. 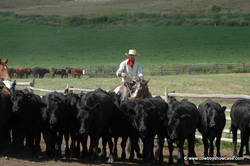 Crews of cowboys relay herds of around 250 cows and their calves into the higher alpine summer country. Bulls are hauled out or driven from headquarters and placed with these small bunches of cattle. The ratio of bulls to cows on this ranch is one bull to 18 cows. Cattle summer out on the mountain, tended by cowboys in isolated camps. In October, cows and calves start to drift down or are driven by cowboys onto two huge mountain meadows where they are held. Calves weighing around 550 pounds are weaned there in sorting corrals. The calves are sorted off, then sold, and hauled off in cattle trucks to Williams Lake. Bulls, around 500 replacement heifers, and thin cows are trailed off the mountain and placed on the hay meadows near headquarters that had been harvested earlier in the year. 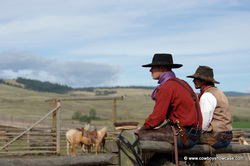 The main cowherd remains behind, cows are pregnancy tested, and stay in the upper country, held by the cowboys, until around the end of December. Cows then come off the mountain and are fed on feed grounds at the main ranch. 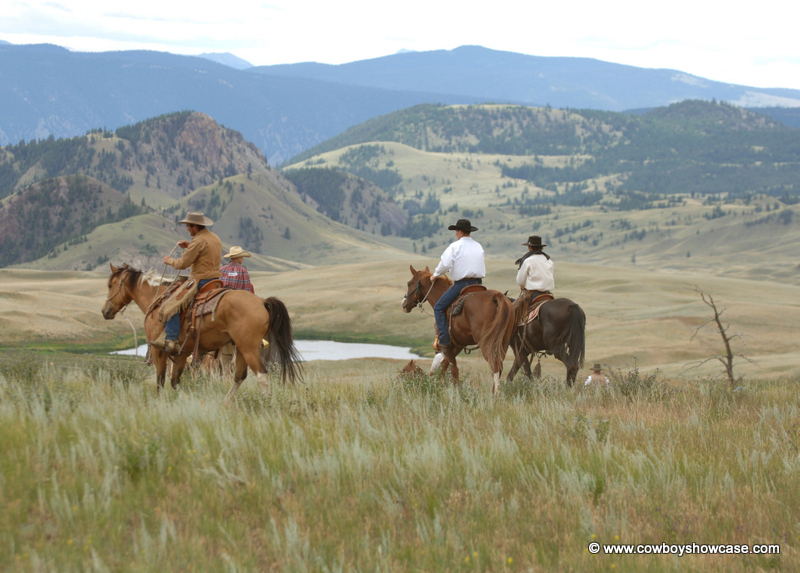 Ranch cattle and cowboys will make about a 150 miles circle during the year. Larry said, “We never stop moving cows or looking for cows, calves and bulls on this ranch.” That amounts to a lot of horse tracks and cattle herding on the Gang in a year. Much of the land surface within the Gang is covered with timber. An active commercial logging operation goes on throughout the year, weather permitting. Wild animals include moose, grizzly bear, black bear, cougar, timber wolves, mule deer, and California Big Horn sheep. The most serious problem caused by predators upon cattle is predation by black bear on the newborn calves in the spring. Grizzly bears and wolves take an occasional cow or calf in summer and fall. The number one and two World’s Record California Big Horn Sheep were taken near the Gang Ranch. An outfitter has the ranch leased and handles all the big game hunting. No outside private hunting is allowed. Despite two-way radios, fax machines, e-mail, computers and phones that Larry and Bev have at their disposal, there are still cattle grazing and cowboys riding just like they did 100 years ago when the Harper’s first settled this land. It is a good feeling to know that some things never change on this historic ranch. . Thanks to the Ramstads and Ray and Carolyn Hunt for inviting us to the Gang. We certainly did enjoy the trip! 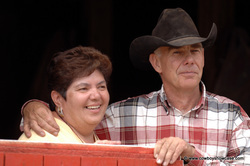 We asked Larry and Bev to tell us how Ray Hunt first came to do clinics at the Gang Ranch in British Columbia. Larry said, “In 1980, I attended a livestock meeting in San Antonio, Texas. At that time, I was managing a different ranch in British Columbia. A Canadian cattle rancher and horseman I knew met me one morning in the hotel lobby where we were staying and asked me if I was going to watch this guy work on a colt at the horse clinic that morning. At that time, I did not know who ‘that guy’ was and hadn’t planned to attend. I thought, this is just another clinic guy running a colt around the round pen with some driving reins for a couple of hours. But my friend said, ‘If you see nothing else while you are here, you need to go to this clinic.’ So, respecting his judgment, I decided to attend. 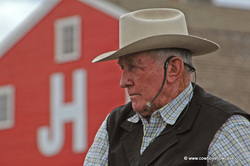 ‘This guy’ was Ray Hunt and in the round pen he had a 3-year-old mare that had been halter broke but never saddled. In about three hours, he had the colt saddled, was riding around, doing figure eights, backing up, etc. and the colt began to get real soft, with just a rope around her neck. I was amazed at how easy this looked. I attended a number of clinics Ray gave in Canada during the next few years and decided if I ever was in the position to do it, I would have Ray Hunt do a clinic and help start my ranch colts. 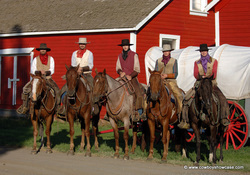 Participants from several provinces of Canada and several states in the US hauled their horses hundreds of miles to the Gang Ranch to attend the clinic in late July 2005. 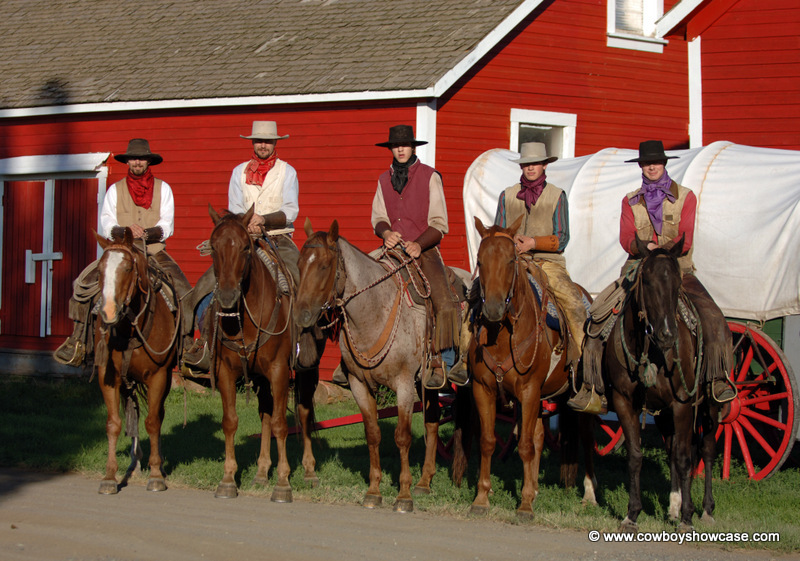 Ray helped the cowboys start about fourteen Gang ranch colts. He also assisted the outside clinic participants with their colts. In the afternoon, Ray held horsemanship sessions for the cowboys and the clinic participants. The second day of the clinic, the folks were riding their green colts outside. Many of them rode their colts about five miles up to a lodge on the ranch where lunch was served, then rode back to the headquarters. Many of the horse people in attendance had participated in a Gang ranch clinic in past years. To haul horses as far as these folks did to come to this remote ranch was a real tribute to Ray and his ability to teach.